Culver Ltd was founded in Brooklyn, New York in 1939 by Irving Rothenberg. 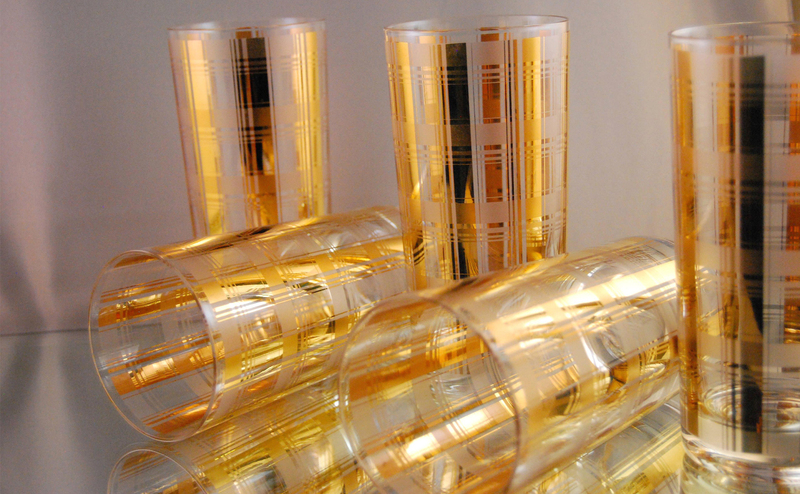 Culver Glass features real 22-karat gold decoration used effusively and magnificently especially from the late 1950’s on through the 1960’s. The company gained notoriety and its products became highly collectible and only sold at high-end department stores. In 1980, the company moved to downtown Rahway, New Jersey. Irving Rothenberg passed away in 1987 and his son, Mark ‘Mickey’ Rothenberg, continued the Culver Glass Company. Mickey ran the company until he sold Culver Ltd. in 1996 to Moderne Glass Company, Inc. Mickey Rothenberg continued in the glass manufacturing business by running another glass company until his death on 9/11. He was one of the passengers on the hijacked Newark-to-San-Francisco flight that crashed in Pennsylvania. The company’s early production line featured acid etch, decalcomania, sandblasted, hand-painted, banded, sand-cut monogramming and silk screen. 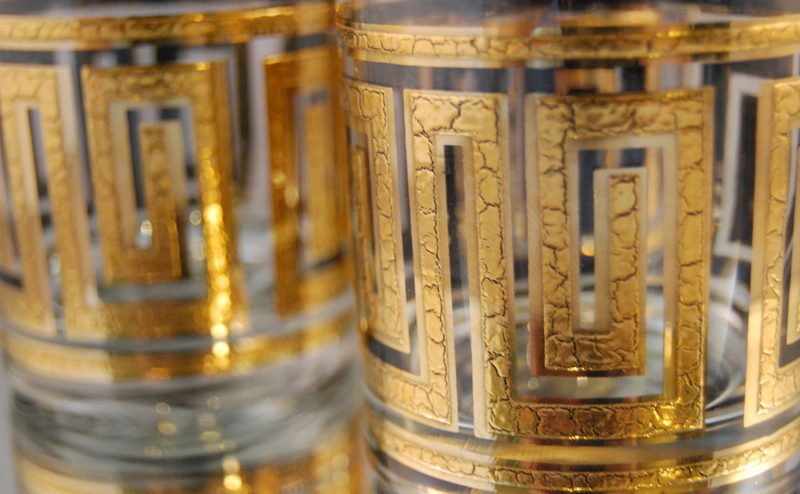 In the late 1950’s, Culver Ltd started the application of the 22-karat gold to their glassware. The super-heated, roll-on process of gold remains a secret today. By the 1980’s, Culver stopped making its own glass and began using glassware ‘blanks’ produced by other companies. Culver glass from the 1940’s through the ’50s are signed with a script Culver. The Culver mark changed to block lettering in the late 1960’s through the 1970’s. Culver glass after the 1970s are typically unmarked today because the company changed to paper labels attached to the glass. Many of these labels have disappeared from use. Culver cocktailware is highly collectible and remains popular today. Classy Concoctions have several Culver cocktail sets to embellish your next Cocktail Hour. Click below to view the different Culver Glass Collections. I have a late 1950s set with numerous seashells in different types on each glass. I am unable to find this pattern anywhere. The glasses are marked Culver Ltd in cursive and all the application is in gold. I’m guessing this is a rate pattern since I have been unsuccessful in finding any other Culver products with this pattern. Any answers for me? I have a martini pitcher, 6- 8oz glasses and an ice bowl with opened cotton boll on them. I have had no luck in finding this particular pattern. All items are marked in cursive Culver, Ltd and in gold. Can any one help me find this pattern or have any answers? Did not see this pattern. 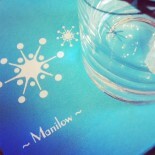 Is there a way for me to send you a photo of the glassware? Thanks. I came across 2 unopened boxes of Culver glasses marked “Arabesque White” 755-024 set of 4 D.O.F glasses, 4 oz. They are marked with “Culver” directly on the glasses and also have the foil removable label stating they are 22 Karat gold. Any idea of the manufacture date of these? I have no luck with the pattern info online. Here is a little tip for figuring out dates of Culver glassware. Glasses feature a gold script lettering Culver are from the 1940’s to the early/mid 1960’s. Glasses featuring Culver in good block lettering were made during the late 1960’s through the late 1970’s. Gold foil stickers were used during the mid to late 1970’s. many of Culver glasses today are unmarked because the foil stickers have been lost. I would assume that your set is from the 1970’s era by the gold foil sticker. I received a set of 8 tall glasses that I cannot locate the pattern on any of the websites. Any idea on who I can contact to get some information on what style they are? You send a picture to classyconcoctions@comcast.net and we could know the pattern. If not, replacements.com has some useful information. I have a set of 8 Valencia glasses. What could you tell me about them and where could I find more information? I have a Bar Set of stacked frosted glass bowls (small) that are for ‘Olives’, ‘Cherries’ and, ‘Onions’. The lettering for these are in the 22k gold with the Culver LTD in the fancy lacy type surrounding of the words. What can anyone tell me about this set. There is a lid that has a 22k gold glass knob shape for the lid. I have a set of Orange w/ gold pattern Culver glasses. They are in a “carrier”. I can’t find any information on them. Nor can I find anything in this color. Are these rare? What did you do there? My father was the designer for years and years. Was your father in the Coney Island plant? There were 3 locations in all. Coney Island, Dean Street and Rahway, NJ. To Annabelle Steiner I meant what did HE do there? Please contact me. My father, Moses Worthman was the designer of most of Culver’s glassware. How interesting! I would love to learn more about his craft at Culver. Thank you for reaching out. Sorry this took so long. Life interferes. I am trying to get his name and reputation out there. There seems to be a very solid interest in Culver Glassware, and Culver Glassware would never have been the success that it was without my father, who was a designer par excellence. Stumbled on 2 Culver glasses, elegant! Will the gold ever fade? Culver usually used 22 karat gold on the glassware. It should not fade, but will disappear in time if washed in the dishwasher or using harsh household detergents (windex). Always hand wash your vintage glassware with a mild dish soap like ivory or meyer’s organic dish soap. Do you have a email that I could contact you through. I have something and was wondering if I sent you a pic of it. if you could tell me more about it. I work with the Flight 93 Oral History and Documention Project. I read your posts concerning your father’s employment with Culver Glass with interest. Wondering if your father knew Mark “Mickey” Rothenberg, son of Irving Rothenberg, who operated the business for a number of years? Mark Rothenberg was a passenger aboard Flight 93 and was killed when the plane crashed in a field in Pennsylvania on September 11, 2001. Flight 93 is credited with thwarting this attack by terrorists on their intended target in Washington, D.C.
Hi Bonnie, I was very happy to come across the information that your father designed Culver glasses. I have some Culver sets, which I love, but a friend recently gave me a set of glasses that are signed “Moss Worth” (not “Culver”). Did your father have his own company at some point? I’d really like to know more about these glasses. They are double Old Fashioned size, black with gold images from the oil industry. No lettering other than Moss Worth. Hi Bonnie, I have a relative that knew your father well. Like you, I am trying to get him the credit and recognition he deserves. He was at Culver for many years. Have a set of Cincinnati Zoo glasses with Culver sticker. Guess they would date from the 1970s. Anyone have any other info on these? Can’t find any other examples online. As my father, Moss Worth, was Culver’s glassware designer (A fact that is left out of all the articles) I knew Phyllis very well and liked her a lot. Culver glassware is a favorite of mine. It was interesting to hear about your father the designer who is never credited for the gorgeous designs. It is actually hard to find any info online about the company and patterns etc. I sell vintage and have a beautiful set of six Culver Holiday glasses complete with the Caddy in excellent condition, It has a pattern of frosted glass and holly leaves and of course 22KT gold. I could never find out the name,( I have never seen another set like it for sale). I estimate it to be 1950’s. I recently came across some low ball frosted Culver glasses with small gold Christmas trees, and Block lettering for the Signature, which I have read places it in the late 1960’s-70’s. It sure would be interesting to hear more about your Father and his designs, did you ever see any of his artwork or what he was designing as he worked on projects? Bonnie, my father worked there for many years and I am trying to get some history and info. Can you contact me? Hi Bonnie, my grandfather knew your father very well. He worked with Culver for many years. I have heard many wonderful stories (some where your dad was mentioned) I lived in Brooklyn for a short time myself. Great memories!!! I have a cocktail set of 6 glasses and ice bucket with the 22 karat gold fruit motif that has Culver’s signature in script lettering. They are oretty much in mint condition. I’m trying to find out the name of the pattern and the value. I had a set including a martini pitcher and 4 roly poly glasses in the fruit pattern that I read somewhere was called Florentine Fruit. But have seen most people just list it as gold fruit. Hi Bonnie, I dont Know what exactly he did, I remenber He told us his work was so hard because he worked near ovens with high temperature. He worked at New York Plant I guess in Brooklyn, …. He Stopped to work in Culver when the company moved to New Jersey.. I have a set of 4 rocks glasses with little cats amd 22k gold all over I was wonderimg what they are worth. What style glass is it? Are they signed by Culver and what type of lettering? What does the pattern look like – floral, Asian, geometric, etc.? Hi, I just found a bunch of lowballs with the signature. I had been wanting them but I don’t know the actual pattern name. They have cotton bolls on them and are gold and white and brown. Helping price items for a church yard sale…came across a Culver tumbler with a two-tone design. The main design of the glass looks like it has small grain/wheat design in an arch over stripped window. If anyone can help identify the pattern name, that would be great! Hi – I have a set of 8 highballs that are gold and black with the Carte Blanche credit card, American Express credit card, and the Diners Club card on them. The rim is a series of $’s. They are signed in script at the bottom. I would love some additional information if possible! Thanks so much! Hi I have a set of 8 highball owl glasses they are signed with a script at the bottom, could you share how owl these would be and there value. All in excellent condition, never used. Thank you. The owl pattern by Culver features two owls sitting on branch with a gold ring around the rim. The pattern is called Owls – CUVOWL. The gold is 22karat. The script style text CULVER was produced during the early to mid-1950’s. This is a common pattern and can be found easily on the market. 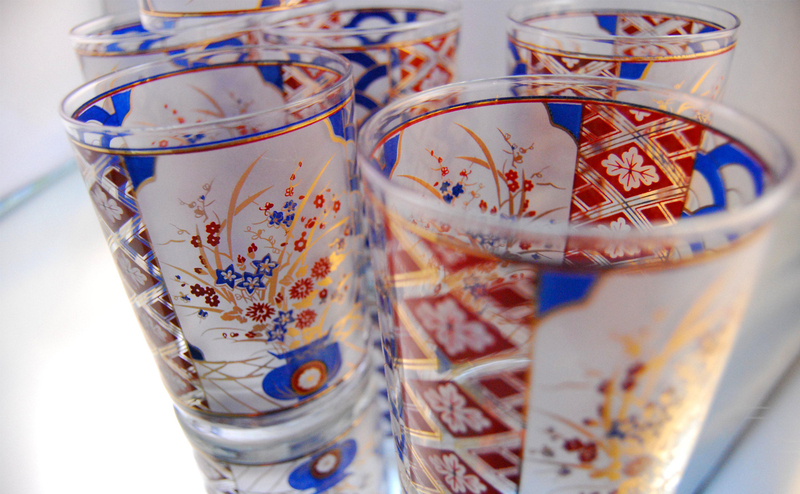 Highballs in excellent condition with no to little wear to the gold leaf are valued around $10.00 to $12.00 each. I am not having any luck finding my pattern after several Google searches and wondered if anyone can help. I have a set of four lowballs – gold pinstripe with blue bands marked with Culver in block lettering. The pattern looks very similar to the Devon Black on replacements.com, except the band is blue and there is a double gold stripe below the band as opposed to a single. Any help is appreciated! Actually they look very similar to your Devon Old-Fashioned picture on your blog post except there is a blue band above the double gold stripe on the bottom. I have the Culver mushroom glasses. I believe my parents bought them in the 1970’s. Where would be the best place to sell them and how much are they worth? They are in perfect condition – hardly ever used. They still have the Culver signature on them also. I have set of gold and aqua blue diamond highball glasses with matching cheese board and dip set. has culver ltd 110 . script. Hi I recently found a gold etched glass labeled culver on the side. Then it has a old model a car and underneath it says Detroit the motor city. Underneath that it has copyrighted the name PERRIN. Do anyone know anything about this glass? Are the 22k gold culver ltd glasses safe to drink out of? My mother in law just gave me a set and I was wanting to know if it’s safe to use or should strictly be for show. I couldn’t find any information on this. Did you ever receive an answer for your question regarding the safety of drinking from glasses etched in gold? I, too, am concerned about the safety and would be grateful for any information. We have six goblets with the owls on it – CUVOWL that are in great condition any idea on their worth? Thanks!! Thank you for the info. on your blog about Culver. I just found a set of 8 rudolph the red nosed reindeer 12 oz highball glasses in mint condition signed in cursive and with lots of 22k gold detail. At Goodwill!!! Any idea of their value? Ebay has them listed anywhere from $65 to $130 for a set of 6 and a set of 9. Sad and interesting to read about the founder’s son dying in Pennsylvania. I have a set of Signed Culver Scroll Barware glasses with Orange & 22k gold, but I can’t find information about them or there value so if you could help me? Is all Culver barware signed? I just picked up a very nice 8 piece set with clear ice bucket and tongs all in a stand for a ridiculous price. Decided it must be a knock off. Thoughts? I have several highball glasses and sets of 6 heavy-bottomed whiskey and large rocks glasses. The pattern is turquoise and gold with Asian horseback riders that look like they may be playing polo. On the small whiskey glasses, there is an etched script signature on the bottom of the glasses that I cannot read. I cannot find one on the larger rocks glasses. These originally had a gold toned carrier and are from the 50s. I would like to get more of the highball glasses, but do not know if these are Culver glasses, or another manufacturer. Can anyone help me? After some additional research (see above comment/question), I believe that these glasses may be Fred Press. However, there is no signature like his other glassware. Is it possible these are still Fred Press? This is so very interesting because I met Mr. Rothenberg several times in Brooklyn and then once in New Jersey. My father and I designed and manufactured the machinery in the Bronx N.Y., which screen printed the various glasses. The company was called ALPEHA Machine Corp. Mr. Rothenberg wanted to print with tall manual machines where the operator was required to stand. The screen was tilted down to the glass (not touching) and the Squeegee was pushed down manually. Then the operator moved the screen across from one stop to the other. A very long taper made it possible that the screen would move across like a windshield wiper. 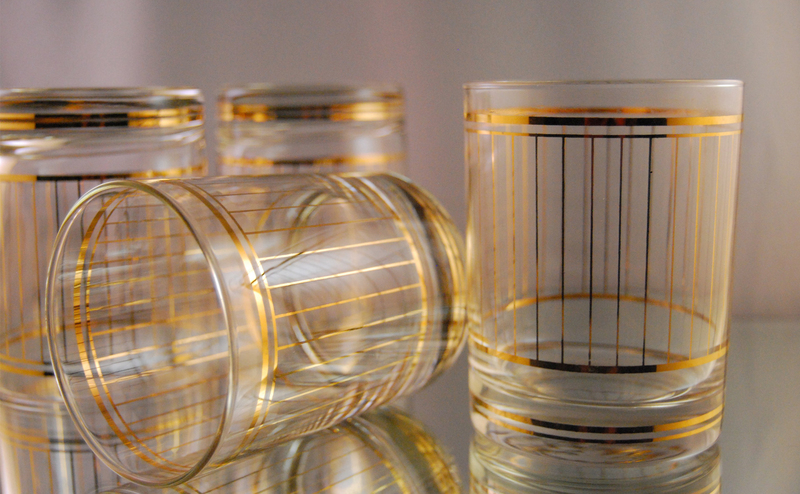 The taper was established where the two glass sides would intersect at the bottom of the glass. Sometimes it was over 36” long. That intersection point was then the pivot location of the screen as it was pushed from one side to the other. The glassware had to be handled many times for getting all the passes just right. Each successive color had to be registered to the first and then be fired in a lear for about 4 hours plus slow cooling off period in-between, if I remember right. . This required much handling… and to register another color to match the previous one — a little steel pencil shaped pointer was mounted on the fixture and used to locate the 1st color by eyeballing it. This was work intensive. There was no requirement for automatic printers. Mr. Rothenberg liked the manual method for better control. Perhaps that is one of the reasons Culver had slowly faded away. Quality was just more important. It’s sad about the 9/11 story. Perhaps my late father met Mr. Worthman too, yet that was quite a while ago. I too have glasses yet which we picked up at discount many times before Christmas and they were kept or given to friends then as gifts. After reading about the history of this company I believe we will keep these for a while yet– for they are a piece of Americana and we will never see the raised gold design like this again. Last but not least many glasses had the name George Briard also displayed too. I am SO glad that I stumbled on this site!! I love vintage barware and am always trying to find out the history of the various companies. I have a set of 6 Ebony Baroque highball glasses that I love and USE!! They are still in pristine condition and are the PERFECT mojito glass. I would love to hear even more about the company and the designers that worked there. Hi. I found some Culver glass at a thrift store and cant identify the pattern. Culver is in scipt and its a greek key pattern done in white, orange and gold around the top with columns below in white. Any help would be appreicated! This is regarding your article written on April 2, 2013 which I recently came across. I’d like to set the record straight about Culver Glassware Company. My name is Joni Rothenberg Konsky and my father was Abe Rothenberg, the founder, creator and sole owner of Culver. He created many of the designs for the glassware collections and serving dishes. Moses ‘Moe’ Worthman (Bonnie Worthman Goodman’s father) was a major contributor as a designer for my father’s company as well. He was a very talented artist-they worked hand in hand for many years. Irving Rothenberg (my father’s brother) was brought into the business by my father and many years later was made a partner. My father passed away in 1966 and Irving Rothenberg became the owner. My cousin, Mark ‘Mickey’ Rothenberg was brought into the business sometime later by his father and I assume he became the sole owner of Culver after Irving died. Also, as a point of information, Culver got the name from the original location on McDonald Ave in Brooklyn that was located under the “CULVER” train line. Finally, I would like to point out that without Abe Rothenberg’s ideas, inventions, designs and processes that created the products, there would not have been a Culver Glassware. Being that you have an interest in Culver, I wanted to make sure that you have the accurate history of the Company. I was so happy to see that you and many others still remember the CULVER name. I have four old fashioned/lo ball glasses with CULVER in gold block letters. The have what appear to be gold seagulls in flight around the glass, one bird has a large bronze circle behind him-the sun. I cannot find anything about these. The have been in my mother’s house for at least 30 years. Does anyone know anything about that design? Just acquired 16 Culver glasses… 12 dbl highballs and 4 rocks ,,, they have beautiful life-like yellow Butterflies that are highly embellished with 22k gold. I have found Culver Butterfly glasses during research but non like these…. others were mostly stylized and less elegant. The signature is the cursive mark from 1940’s to the 60’s…. can anyone give me any information on them at all? Thanks!! I have a set of 8 Valencia glasses. Could you tell me about them and what their value would be, or where I could find out more. My wife’s grandmother gave me a 4set of leopard print gold banded rocks glasses a few years ago. I love them. Mid 60’s I guess. Neat stuff. 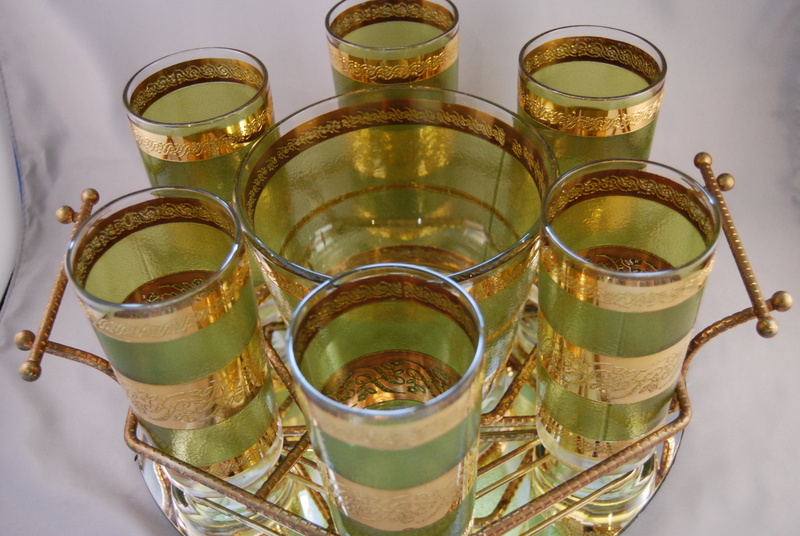 I just purchased a set of Starlyte green and gold glasses, ice bucket, and gold brass holder. I see a photo of the set on this site. I have been told Starlyte was made by Libbey, not Culver. Will anyone confirm? I owned the same set and have only seen it listed as made by Culver. Where did you see it as a Libbey product? 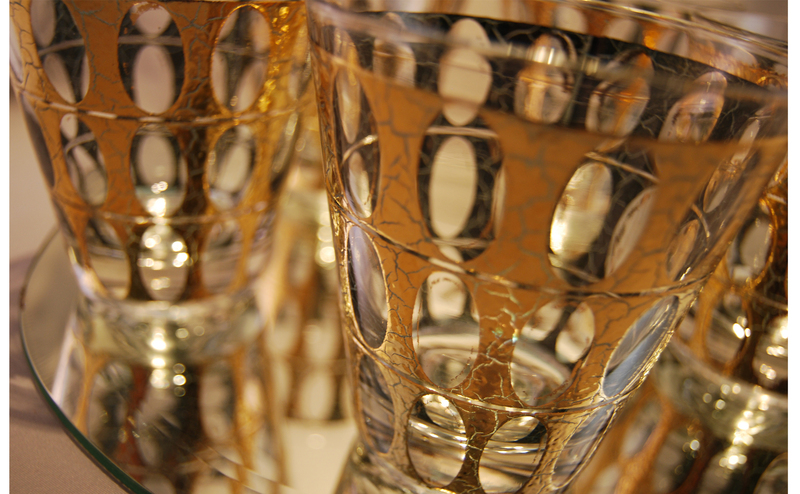 Not this pattern, but a lot of the gold leaf frosted glasses are being called Libbey Starlyte. An “expert” on ebay says Starlyte was made by Libbey. I have yet to find Starlyte officially linked to any manufacturer. See the two sites below. The Starlyte printed on my green and gold glasses looks identical to the Starlyte printed on these glasses. So these are all either Culver, Libbey, or neither. What is your opinion? Pam, I just found some interesting information. My green and gold Starlyte set was not made by Culver or Libbey. It was made by Continental Can Co. or Hazel Atlas. My glasses have a mark on the underside of the base of 3 letter Cs nestled in one another. That is the Continental Can Co. mark according to the website glass bottle marks dot com. CCC purchased Hazel Atlas in 1957 according to that website. Do your glasses also have the CCC nestled in each other on the underside of the base? I have a photo if you want to see it, but you would need to email me. CCC (3 C’s nested inside each other, see pic)……….Continental Can Company. Mostly seen on tableware, especially on the bases of drinking glasses (juice glasses, tea glasses, tumblers). Continental Can Company, a producer of several types of packaging, took over the Hazel Atlas Glass Company in 1957. Continental sold most of the H-A plants in 1964. It is unclear exactly what years the “CCC” mark was used on glassware, but it is clear that at least some of the new molds made for glassware during the period of 1957-1964 were engraved with the CCC mark instead of the H-A mark. The mark is frequently seen on the bottom of glassware in the popular pattern “Optic Dot”, sometimes called “Thumbprint”. If anyone owns a Ponderosa Ranch set of Culver glasses, I am very interested in buying them. This entry was posted on April 2, 2013 by Norps in Culver Glass Company, Retro Glassware, Vintage Barware and tagged Antiqua, Classy Concoctions, Culver Glass, Irving Rothenberg, Mickey Rothenberg, Pisa, Prado, Seville, Valencia, Vintage Glassware.